Many first-time home buyers looking to buy a home try to save on costs by borrowing from family members. Saving for a downpayment can be difficult, and borrowing from family often supplements a buyer’s resources. A 2014 survey by the National Association of Realtors, found that many young adults cited obstacles to saving such as the cost of renting or paying for student loans. The report also found that 81% of first-time buyers used outside resources for their loan downpayment, and 6% received a loan from a relative or friend. In addition to helping a borrower, intra-family loans can provide tax benefits for the lender. Parents may be able to earn interest and avoid a gift tax. 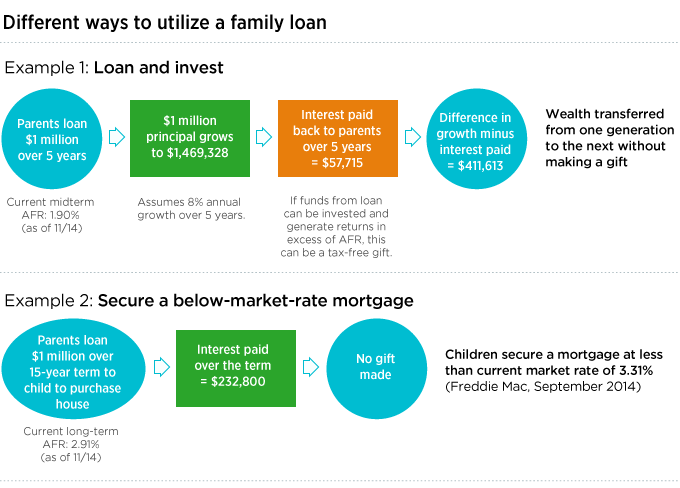 Here are two examples of how a family loan can be utilized. Source: IRS, Applicable Federal Rates (AFR). To avoid errors that could result in a tax liability, there are loan requirements that must be met including a formal promissory note and repayment schedule. The lender can charge a higher interest rate than the current Applicable Federal Rate, but the IRS will consider the loan to be a gift if the rate is lower. To structure the loan appropriately, families may want to consult with a professional advisor or tax expert.